Many people think intelligence is the be-all to evaluating the quality of a person or attributing to their success. However, you’ve probably met someone who is smart and successful, but difficult to be around. Perhaps they’re negative or demanding. Maybe they don’t listen well and tend to blame others for problems. These types of people have brain smarts, but not emotional intelligence. Any follower of Napoleon Hill knows that the ability to control thoughts is important to success in business and life. But often, the controlling of thoughts starts with managing feelings and attitudes, which is the essence of emotional intelligence. The term emotional quotient (EQ) was used in the late 1980s, but the concept was further studied in the early 1990s by two researchers, Peter Salavoy and John Mayer. They used the term “Emotional Intelligence” (EI) to represent “a set of skills hypothesized to contribute to the accurate appraisal and expression of emotion in oneself and in others, the effective regulation of emotion in self and others, and the use of feelings to motivate, plan, and achieve in one's life.” Later, Daniel Goleman popularized the term in his book, Emotional Intelligence: Why It Can Matter More Than IQ. In essence, emotional intelligence is about being able to recognize and understand your emotions and those of the people around you and manage them in a way that is productive and healthy. Self-Aware: They understand their emotions and therefore can better manage them. Self-Regulating: They can take a moment to reflect on their feelings, instead of acting impulsively. Motivated: They are productive and effective in achieving short and long-term goals. Empathetic: They are able to recognize the feelings and viewpoints of others without judgment, which makes them good at working with and leading others. Socially Adept: They tend to be team players, and are approachable and friendly. Resilient: They know that life is filled with ups and downs and that they can survive the downs. They don’t let challenges keep them from pushing toward their goals. Recognize emotions in yourself and others: What are you feeling? What are others feeling? This requires understanding emotional cues, such as a fast heart rate when angry, and facial or body cues from others. Understand your emotions: Why are you feeling this way? Evaluate your emotions: Is your emotional response appropriate? 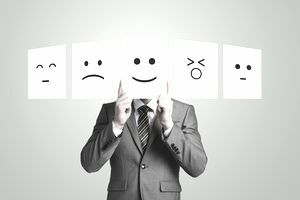 Respond to Your Emotions: How can you work with your emotions to affect a positive outcome? Emotional intelligence isn’t about trying to avoid or dismiss negative feelings, but instead, it’s to understand and manage them in a way that is helpful in your life. For example, you can be angry that someone left you a bad review or asked for a refund, but ranting and raving only continues to make you feel bad. Responding by attacking the reviewer or customer will hurt your business. Instead, you can stop to evaluate the appropriateness of the review or return (perhaps there’s something there you can fix) or simply recognize that you can’t make everyone happy all the time, and move on to the next sale. Why is Emotional Intelligence Important in a Home Business? Running a home business is an emotional roller coaster of highs and lows, twists and turns, and often loop-dee-loops. Without good emotional management, you’ll be a hot mess. The reality is, many people who are not successful in a home business have difficulty managing their negative emotions. They take failure and use it to justify quitting. Feel about your business. When you’re having success, you’ll feel good, but when you experience failure, disappointment, and frustration, you’ll likely feel unmotivated and perhaps think about quitting. Behave. If you feel depressed, it’s difficult to work, which can impact your productivity. Treat others. Feelings of frustration or anger can be turned on others, even if they’re not involved. When Do You Need Good Emotional Intelligence in Your Business? Emotions are always at play in your life, although sometimes they may seem neutral. However, when emotions have the risk of moving into extremes that can impact how to behave or treat others, is when you need good emotional intelligence. In general, when you’re feeling successful and confident, you’ll be productive, so you may not think positive emotions might slow you down. However, if you’re feeling so confident that you decide to coast on your success, chances are you’ll have problems. Success in a home business is obtained through regular, sustained effort. While you can coast some on momentum, for example, if you’re sick or take a vacation, you cannot rely on that forever. So even when you’re feeling good, you need to make sure those emotions aren’t leading you to slack off. While there is a debate between nature versus nurture in human development, conventional thought is that most people are born with a temperament that impacts how they view and act in the world. Some people are reactionary, while others take things in stride. Some people see the glass half-empty, while others see it half-full and feel blessed to have a glass in the first place. If your emotional responses to challenges tend to lean toward the negative, don’t worry. You can improve your emotional intelligence. Here are 10 ways to build your emotional intelligence. Be self-aware: Learn to recognize your feelings. This means paying attention to physical cues that often have an emotional base such as lethargy when depressed, or tension when stressed. Respond don’t react: This may be the hardest part of improving emotional intelligence because emotional response is often automatic and habit. Instead of letting your impulse take over, take a moment to reflect, and then have a purposeful response. Know your triggers: One of the best ways to change how you respond to emotional highs and lows is to know what causes them. If your first response to a bad review is defeatist thinking, by knowing that, you can better talk yourself out of negative self-talk. Better yet, you can try to avoid triggers if possible. For example, don’t read reviews. Develop empathy: Learn to put yourself in other people’s shoes. Without empathy, you’ll seem self-centered and uncaring. Learn to be positive: This can be especially difficult you’re emotionally down, but the more you can focus on the good in life and business, the happier you’ll be. Take critique well: Instead of taking negative comments as a personal afront, listen and reflect on what is being said. Evaluate if there is merit to the comment. If there is, use it to improve your product or service, or behave better. If not, say thank you and move on. Be resilient: When you get knocked down in business, jump back up. Giving into your fears, frustrations, and failures make you unmotivated will keep you from achieving your full potential in business, as well as life. Have personal responsibility: If it’s everyone else’s fault that your business isn’t is successful, it’s time to find a job. Yes, outside forces can impact your efforts, but ultimately, your success is up to you. If something goes wrong, own it, fix it, and keep on moving toward your goal. Be an active listener: Don’t just hear what is being said, but really pay attention, not just to the words, but the tone and body language. Pay attention to how you communicate: Tone and word choice can significantly influence how others react to you. True leaders are great listeners (#9) as well as great communicators. Don’t under-estimate the power of emotional intelligence to improve your business. The better you can withstand the emotional ups and downs of business and life, the happier and more confident you’ll be, and the better relationships will be.